If you do not want to replicate specific files and folders on the VM guest OS Windows, you can exclude them from the VM replica. In the displayed list, select the VM and click Edit. To define custom settings for a VM added as part of a VM container, you must include the VM in the list as a standalone object. To do this, click Add and choose a VM whose settings you want to customize. Then select the VM in the list and define the necessary settings. 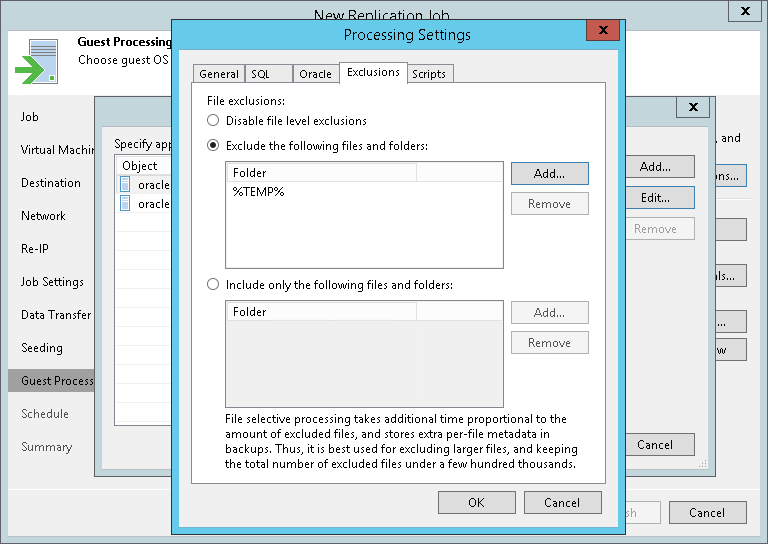 Select Exclude the following files and folders to remove the individual files and folders from the VM replica. Select Include only the following files and folders to leave only the specified files and folders in the VM replica. Click Add and specify what files and folders you want to include or exclude. To form the list of exclusions or inclusions, you can use full paths to files and folders, environmental variables and file masks with the asterisk (*) and question mark (?) characters. For more information, see VM Guest OS Files. Repeat steps 5-6 for every object that you want to exclude or include.